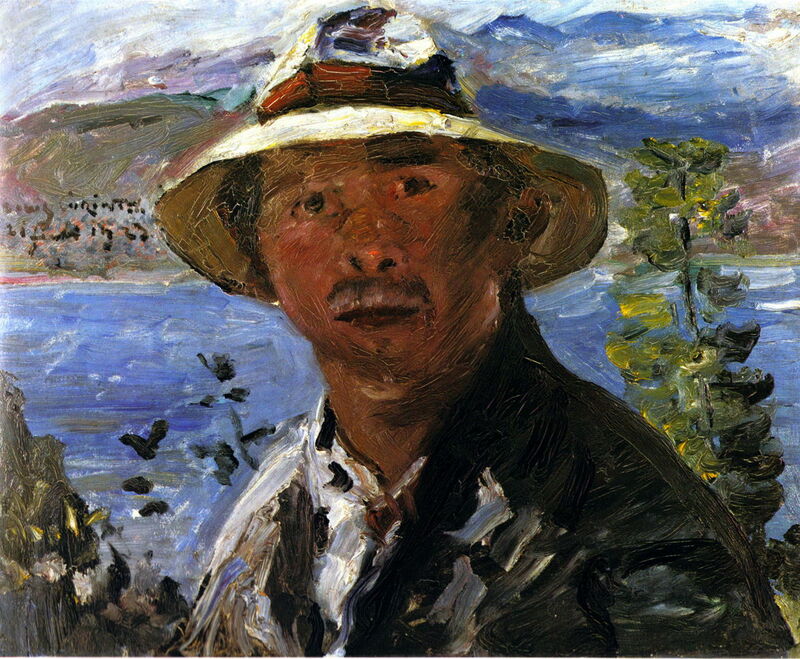 Lovis Corinth (1858–1925), Self-portrait in a Straw Hat (1923), cardboard, 70 x 85 cm, Kunstmuseum Bern, Switzerland. Wikimedia Commons. In the autumn of 1919, Corinth and his family had moved into their chalet at Urfeld, on the shore of Walchensee (Lake Walchen), to the south of Munich. From then until Corinth’s death, they divided their time between the bustle of Berlin and their garden of Eden by the lake and the mountains. 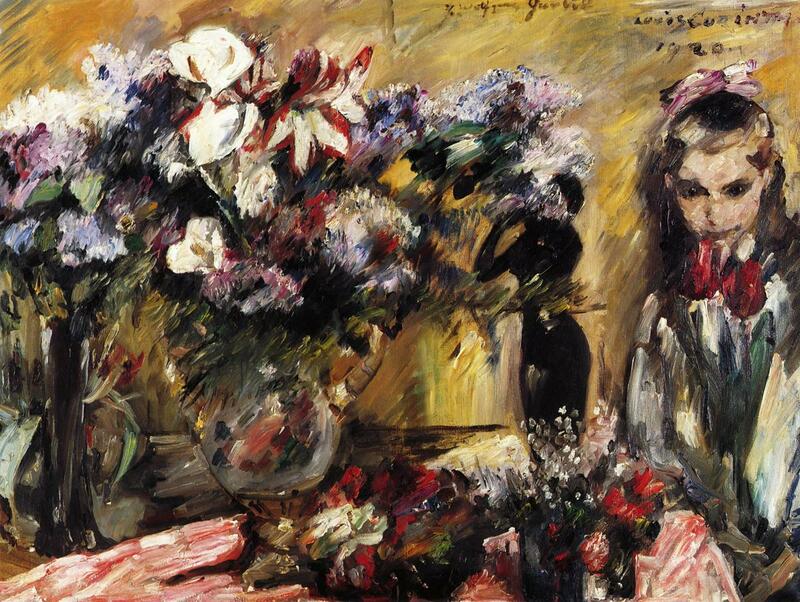 Lovis Corinth (1858–1925), Flowers and Daughter Wilhelmine (1920), oil on canvas, 111 × 150 cm, Kunstmuseum Basel, Basel, Switzerland. Wikimedia Commons. Corinth combined his new enthusiasm for painting floral arrangements with a gentle portrait of his eleven year-old daughter in Flowers and Daughter Wilhelmine (1920). The flowers shown are dominated by amaryllis, arums, and lilacs. The composition probably reflects Wilhelmine’s shyness at that age. Lovis Corinth (1858–1925), Landscape at the Walchensee with Larch (1920), oil on canvas, 85 × 115 cm, Kunsthalle Mannheim, Mannheim, Germany. Wikimedia Commons. During the final six years of his life, he must have painted more than sixty views around the family chalet in Bavaria, of which I can only show a small selection. 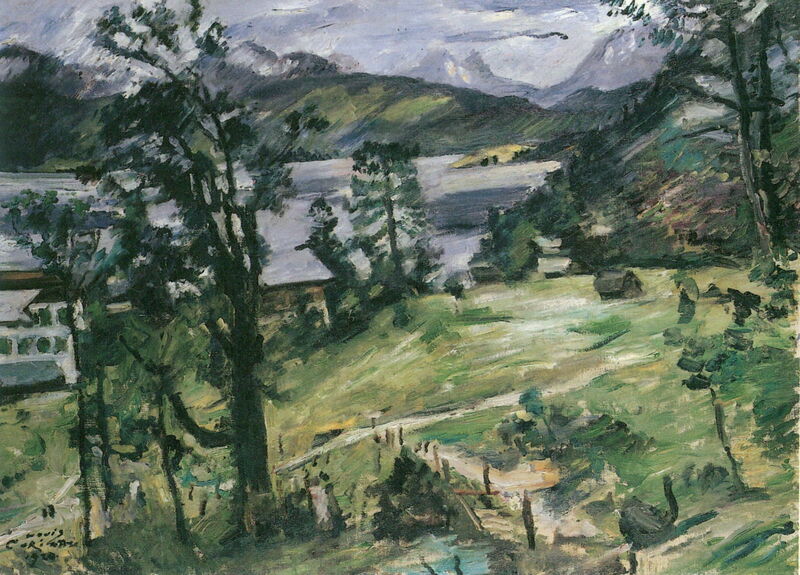 Like many others, Landscape at the Walchensee with Larch (1920) was painted from an observation point on a hill across from the Corinths’ chalet. Bizarrely, this painting was classified as being ‘degenerate art’ by the Nazis in 1937. 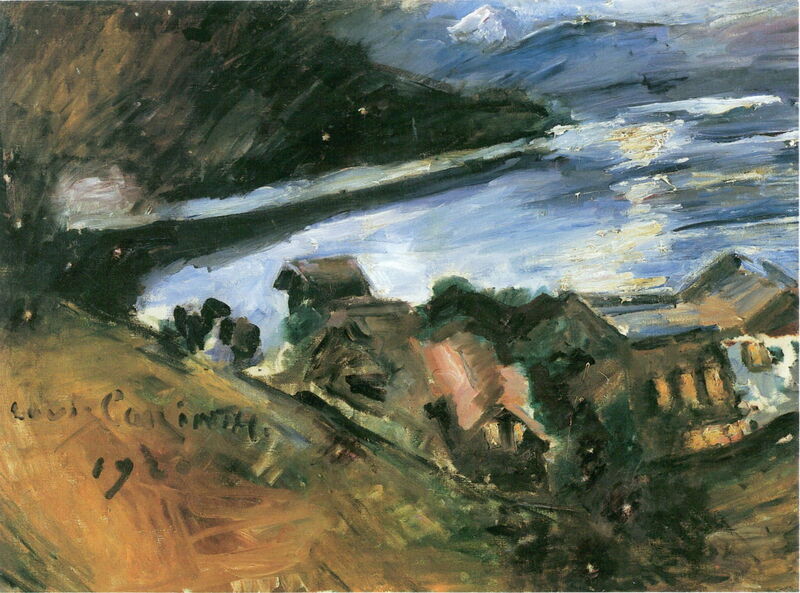 Lovis Corinth (1858–1925), Walchensee by Moonlight (1920), oil on canvas, 78 × 106 cm, Städtische Galerie im Lenbachhaus, Munich. Wikimedia Commons. The local terrain produces some deceptive appearances, but many of Corinth’s late landscapes have marked tilting in their horizontals, and Walchensee by Moonlight (1920) even shows the same leftward lean in its verticals. This had been prominent in the earliest of his paintings in 1912, following his stroke. Here it probably reflects his shift of emphasis from form to areas of colour, particularly the impasto reflections of the moon on the lake’s still surface. In 1921, Corinth was awarded an honorary doctorate and made a professor of arts by the University of Königsberg. Lovis Corinth (1858–1925), Walchensee, Landscape with Cow (c 1921), oil on canvas, 95 × 120 cm, Museumslandschaft Hessen, Kassel, Germany. Wikimedia Commons. Walchensee, Landscape with Cow (c 1921) is another view painted from his ‘pulpit’ vantage point across from the chalet. Lovis Corinth (1858–1925), Walchensee, Evening Air (1921), watercolour, 50.8 × 36.3 cm, Private collection. Wikimedia Commons. Throughout his career, Corinth had made very loose watercolour sketches, usually as preparatory studies for oil paintings. 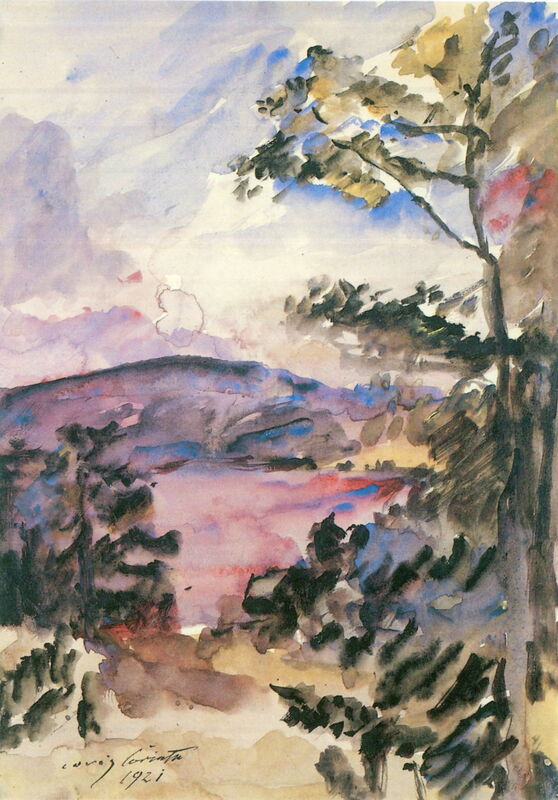 Now, he started to paint watercolour landscapes, such as his Walchensee, Evening Air (1921), which captures the colours of dusk. 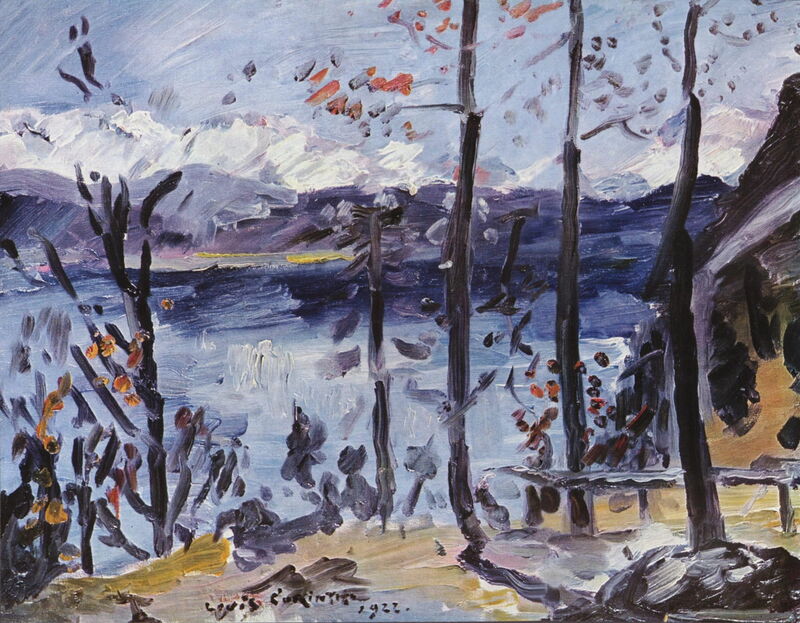 Lovis Corinth (1858–1925), Pink Clouds, Walchensee (1921), watercolour and gouache on wove paper, 36.2 × 51 cm, Detroit Institute of Arts, Detroit, MI. Wikimedia Commons. 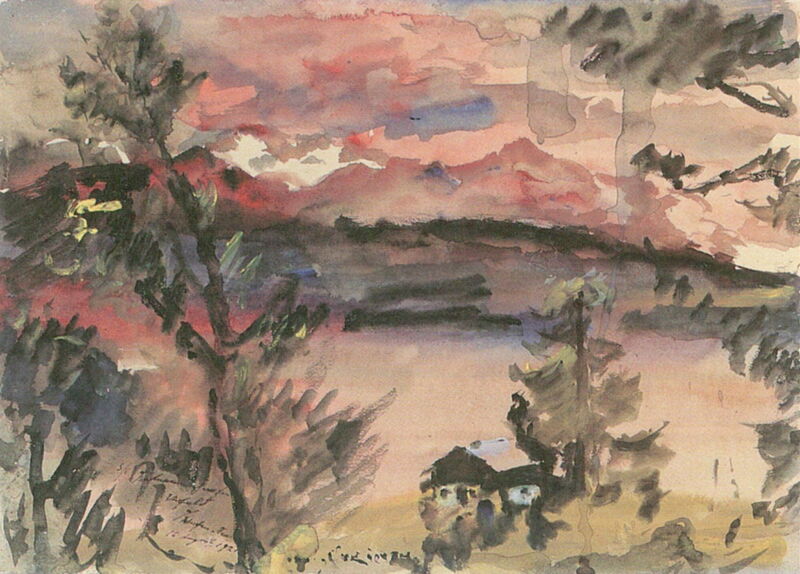 Pink Clouds, Walchensee (1921) is another watercolour showing the rich colours of land and sky as the sun sets. In 1922, his work led the German pavilion at the Venice Biennale, with a total of thirty of his paintings exhibited there. 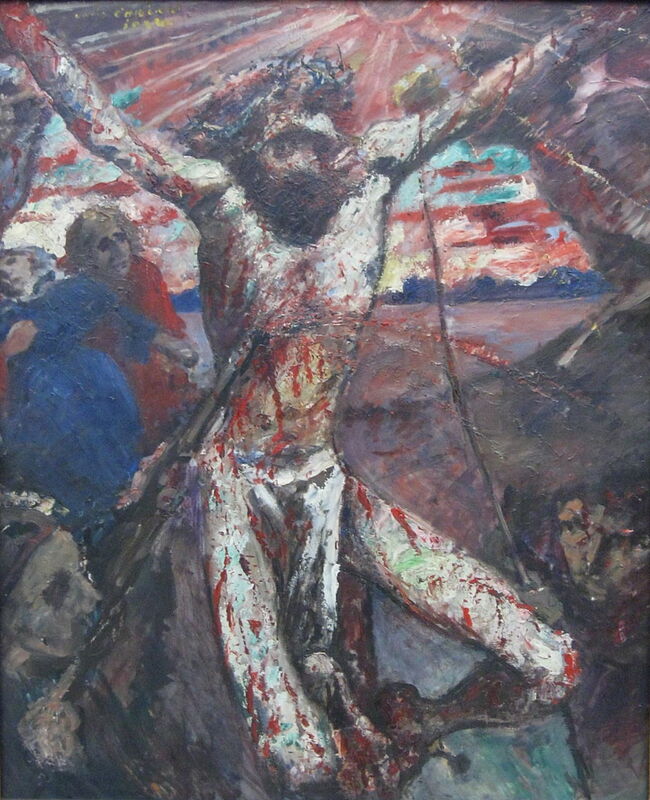 Lovis Corinth (1858–1925), Red Christ (1922), oil on panel, 129 × 108 cm, Pinakothek der Moderne, Munich. Wikimedia Commons. Red Christ (1922) is the last, most striking and original of all his many scenes of the crucifixion. Although very modern in its approach and facture, he chose a traditional wood panel as its support, in keeping with much older religious works. The red of Christ’s blood – spurting from the wound made by a spear, and oozing from his other cuts – is exaggerated by the red of the clouds and the sun’s rays. Lovis Corinth (1858–1925), Easter at Walchensee (1922), oil on canvas, 57 × 75 cm, Private collection. Wikimedia Commons. 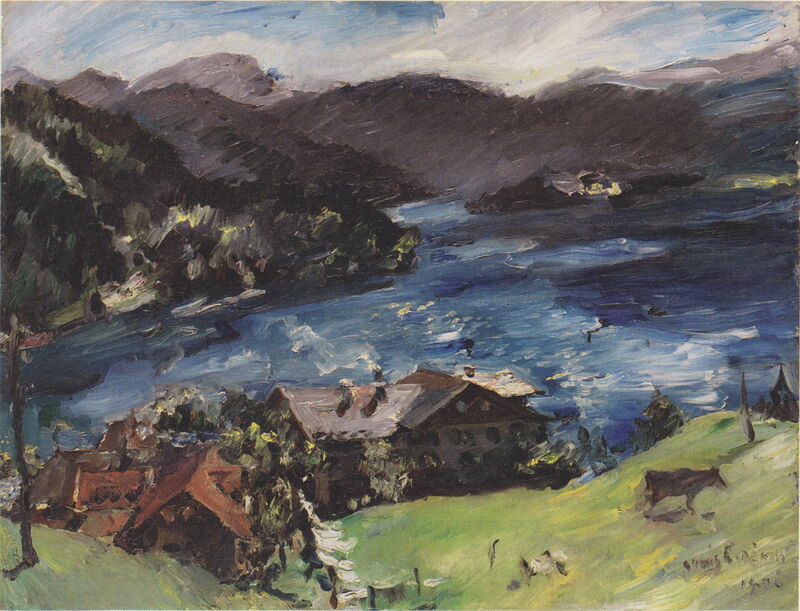 Easter at Walchensee was painted from the family’s chalet in 1922, as the winter snow was melting on the tops of the hills. 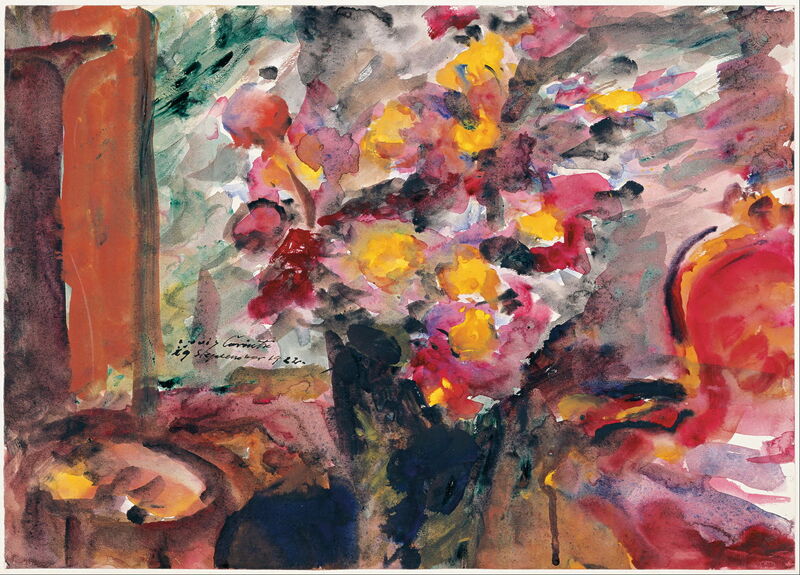 Lovis Corinth (1858–1925), Flower Vase on a Table (1922), watercolour, dimensions not known, Albertina, Vienna, Austria. Wikimedia Commons. Corinth also painted some indoor watercolours. His Flower Vase on a Table (1922) has patches of pure, high-chroma colour for the flowers and the armchair at the right, and few indications of form. During this period of frenetic painting, Corinth appeared at first to flourish in the sunshine and fresh air. His Self-portrait in a Straw Hat from 1923 shows him looking in quite rude health. 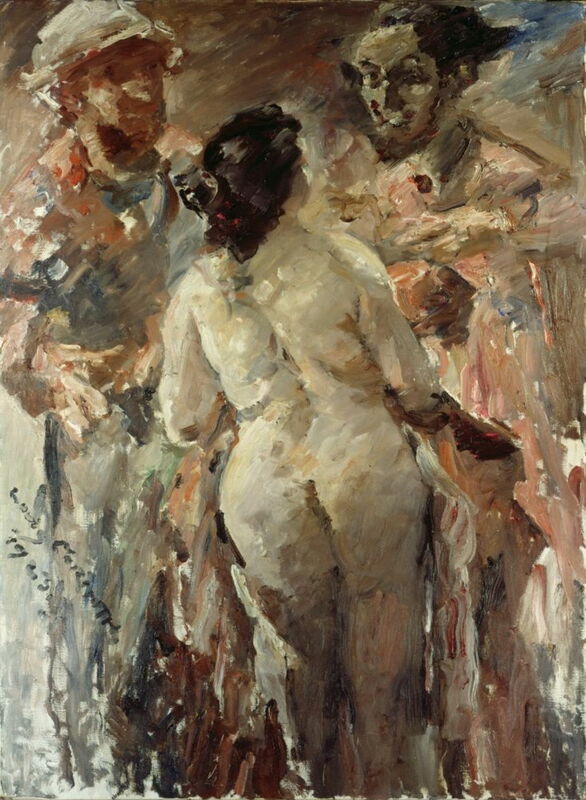 Lovis Corinth (1858–1925), Susanna and the Elders (1923), oil on canvas, 150.5 x 111 cm, Niedersächsisches Landesmuseum Hannover, Hanover, Germany. Wikimedia Commons. Susanna and the Elders (1923) revisits the Old Testament story from the book of Daniel, which had brought him success in 1890. The two versions which he painted then had followed tradition, and shown the naked Susanna being spied on by two elders, who then tried to blackmail her, almost causing her death. Here he shows the three figures talking, as the blackmailers put their proposition to Susanna. 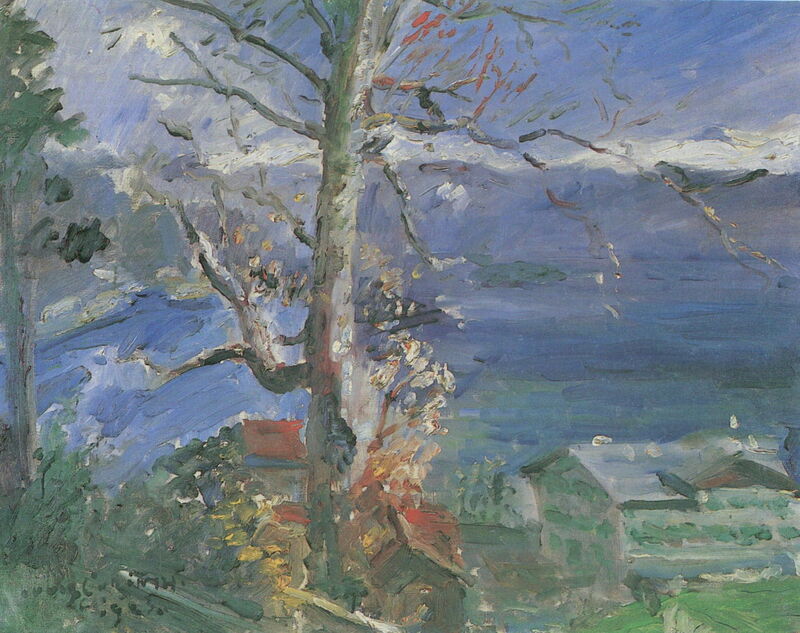 Lovis Corinth (1858–1925), Tree at Walchensee (1923), oil on canvas, 70 × 91 cm, Kunsthaus Zürich, Zürich, Switzerland. Wikimedia Commons. Back in his ‘pulpit’ above the lake, Tree at Walchensee (1923) has the most rectilinear form of all his views of Walchensee, set by the horizontal snowline and the trunk of the tree. 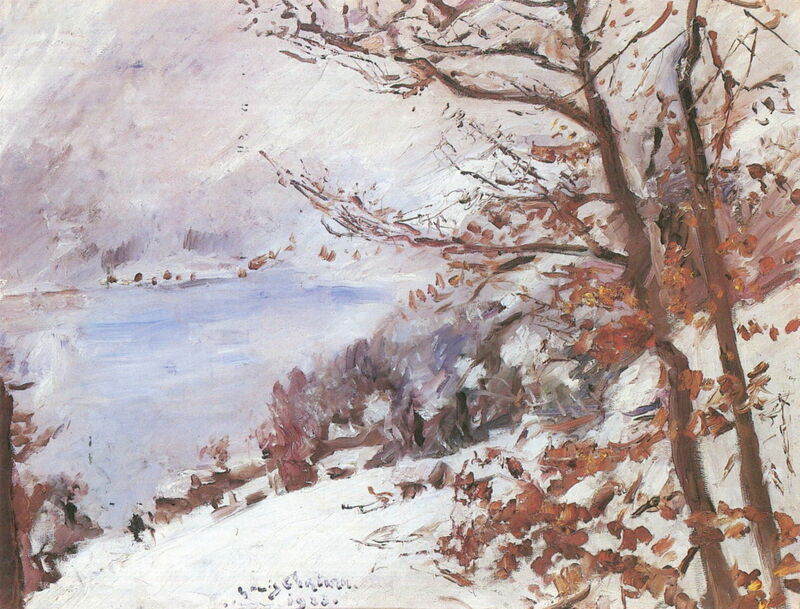 Lovis Corinth (1858–1925), Walchensee in Winter (1923), oil on canvas, 70 × 90 cm, Städelsches Kunstinstitut und Städtische Galerie, Frankfurt. Wikimedia Commons. Walchensee in Winter (1923) is another evocative snowscape. 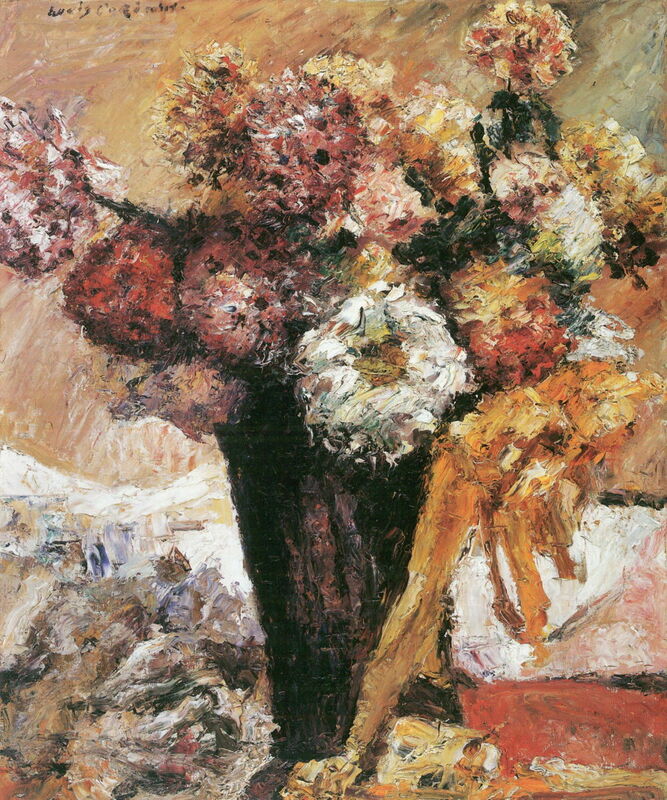 Lovis Corinth (1858–1925), Chrysanthemums II (1923), oil on canvas, 96 × 80 cm, Private collection. Wikimedia Commons. Chrysanthemums II (1923) is my favourite of his late floral works, as the texture of the paint matches the fine petals perfectly.